France in London | A second Oscar for Marion Cotillard? A second Oscar for Marion Cotillard? On 15 January, the prestigious Academy revealed the names of the candidates for the Oscars. And in the race, alongside four great American actresses, there is Marion Cotillard. 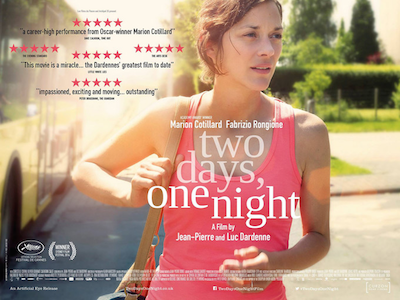 Seven years after La vie en rose, the French actress could well win another golden statuette for her performance in the Dardenne brothers’ latest film, Two Days, One Night. She plays the role of Sandra, who is about to return to work after a long leave of absence. While she was away, the company’s owner has divided up her tasks between the other employees, and offered them a €1000 bonus to take on her work permanently. Effectively, Sandra would have no job to return to. Sandra, who is recovering from a depression, has only a weekend to convince her colleagues to forgo their bonus so that she can keep her job. The competition promises to be tough. Marion Cotillard has, is up against some very stiff competition: Rosamund Pike, Felicity Jones, Reese Witherspoon and Julianne Moore (four nominations, zero award) are running against her. And it must be said that it was a surprise to see her in the Academy’s shortlist, this year. She herself was not expecting it: “that is the last thing I would have imagined”, she said. Well, we do believe in her! The results on 22 February. Even in the Silent era French cinema could boast at least one world-class actress in Francoise Rosay who went on to make three classics in the mid-thirties (all directed by her husband Jacques Feyder) and also starred as the eponymous title character in the initial collaboration of Jacques Prevert and Marcel Carne, Jenny. The emergence of Sound coincided with the emergence of two all-time luminaries of French cinema, Arletty and Danielle Darrieux, supplemented by Edwige Feuilliere and, in mid decade, the iconic Michele Morgan. The subsequent decade threw up Simone Signoret, Micheline Presle, the two Madeleines, Renaud and Robinson, the fifties Jeanne Moreau, Annie Girardot, a constant stream of heavy hitters who could more than hold their own with anything Hollywood or, indeed, the rest of the world could offer. The chain remained - and remains - unbroken so that today we can wallow in the abilities of Isabelle Huppert, Catherine Frot, Fanny Ardant, Karin Viard, Valerie Lemercier, Sandrine Kiberlain, Agnes Jaoui, Isabelle Carre, Sandrine Bonnaire, Nathalie Baye and the new girls on the block Cecile de France, Deborah Francois etc. Marion Cotillard is an integral part of this elite and epitomises all that is best in French cinema. "A wonderful roller coaster of emotions arounf Piaf's life music and breakdowns"